SC21 OE is a voluntary continuous improvement programme for improving operational effectiveness and achieving supply chain excellence. It is the primary route on the Aerospace and Defence Supply Chain Improvement Ladder. Achieving excellent delivery and quality performance, reducing supply chain risk and implementing leaner production methods are just some of the outcomes. The programme is free to join. All the SC21 OE participants commit to developing a working culture that includes focusing on accreditation, development, performance and relationships, with the aim of improving competitiveness by better efficiency, remove duplication, lower overheads and costs in the supply chain, all contributing to an improvement in the bottom line. It follows a simple 4-step framework, culminating in the achievement of industry-recognised performance standard awards, with three possible levels: bronze, silver and gold. Step 1. Launch your improvement journey by registering on the OE programme and engage with our Partners and Practitioners. Step 3. 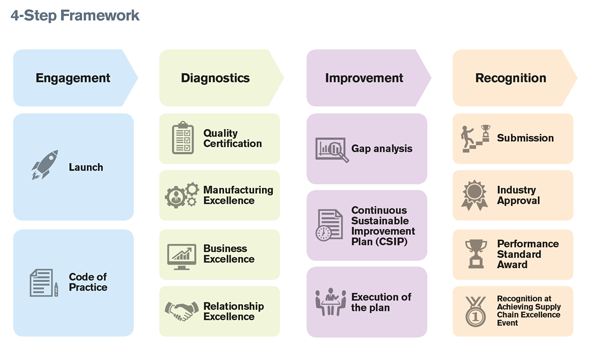 Create a Continuous Sustainable Improvement Plan (CSIP) by using a gap analysis tool, to identify, test and implement solutions for areas for improvement identified during the diagnostics process. The CSIP will enable you to deploy the identified improvements. Step 4. Gain industry wide recognition of your performance by achieving national performance standards and receive an award by submitting your company for recognition. Your submission will be assessed by an independent Industry Approval Board. If successful, your company will be invited to the next ADS “Achieving Supply Chain Excellence” event, where you will be presented with your award by leading industry figures. Furthermore, if selected, your submission will also be promoted nationally as a SC21 Success Story Case Study.